Diopside is usually sold under the name chrome diopside or chromium diopside. Hardly a name suitable for this beautiful green gemstone, but it’s not likely going to change anytime soon. This magnificent green gemstone can easily match itself with far more expensive green gemstones like emeralds or tsavorite garnets, while being more beautiful than cheaper alternatives like moldavite. You just need to take proper care of it, because its wearability is not as high. 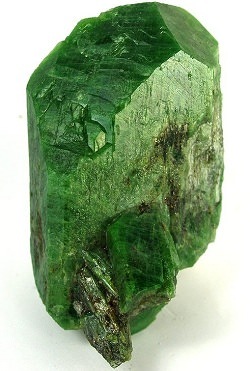 Diopside is a pyroxene mineral that is usually found in a variety of green colors. Though at times blue brown or whitish crystals can be found. Almost all gem quality diopsides are found in either the green variant or as a black star diopside. The green color is caused by the presence of chromium, hence the name chrome diopside. A violet-blue gemstone can be found as well and is known under the name violane diopside. The name diopside is derived from the Greek words ‘di’ which means two or double and ‘opsis’ which means vision. The hardness of diopside is fairly low with just a score of between 5.5 to 6.5 on Mohs hardness scale. Where is Chrome Diopside Found? While diopside can be found in a large number of countries including the USA, gem-quality diopside is more rare. The chrome diopside gemstone is found in Russia (where it was first found in 1988 and can be seen for sale under the name russian diopside), South-Africa, Burma and Pakistan. The black star diopside is only found in India (discovered in 1964). While the violane diopside is even rarer, it can only be found in a single location: Piedmont in Italy. Store it away from other gemstones. Either in a separate compartment or wrapped in a soft cloth, so it doesn’t get scratched by other gemstones or jewelry. Use lukewarm water and a mild soap to clean your diopside, sudden temperature changes and the chemicals usually present in cleaning agents could dull the color of the stone. Because sudden temperature changes are dangerous it’s best not to use a steam jewelry cleaner. Ultrasonic cleaners might be useable, use them at your own risk as chrome diopside is a bit brittle. Only wear your diopside after you’ve put on your makeup and perfume. Diopside does not take kindly to certain chemicals that can be found in some of them. 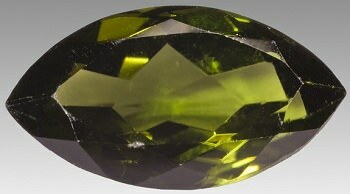 The most important diopside properties for price are color and clarity. A deep green color is considered the most valuable. For clarity you should not settle for anything less than eye-clean. Chrome diopside is quite affordable even in higher qualities. It’s probably best to buy a medium sized chrome diopside, around 3 carats. Below that size the gemstone can look quite dull. While if you go for a stone that is 5 carat or higher the color will become so deep and dark it will almost look black. There are no common enhancements and no synthetic diopside on the market. So it should be relatively easy to get your money’s worth when you buy this gemstone. Be aware that if you go to really shady dealers it’s possible you’ll be sold glass or quartz instead of real diopside. Chrome diopside is relatively unknown and it might be hard to find the piece of chrome diopside jewelry you’re looking for. Your best bet is to ask some of the better known colored gemstone dealers if they’ve got anything coming in soon. Or if they are selling loose gemstones that you can get a diopside set in the piece of jewelry of your choice. One last piece of advice, diopside is fairly brittle and has a low hardness. That means it is not as suitable for rings as some of the harder gemstones like sapphires or diamonds. It is probably better if you either buy chrome diopside earrings or a necklace. They are not likely to be damaged unlike a chrome diopside ring. Diopside, and chrome diopside especially, is starting to gain some popularity among jewelry designers. However it can still be bought for $50-$100 per carat for a high quality gemstone. Which can only be called a steal for a gemstone of this caliber.